Baltic Fleet Commander Vice Admiral Viktor Chirkov and Royal Danish Navy Commander (literally, Admiral Danish Fleet) Rear Admiral Finn Hansen held a protocol meeting on September 8 at conference hall of the Central Naval Museum. The admirals discussed issues of cooperation between the two navies, including anti-piracy operations in the Gulf of Aden. According to RADM Hansen, "those are very important matters for Danish Navy, since about 10% of world merchant shipping is carried out under Danish flag, so we've got much to defend". When the meeting was over, RADM Hansen had the kindness to give an interview to Central Navy Portal despite the very tight schedule. – Sir, what is your estimate of prospective cooperation between our navies? – We are very glad to visit St. Petersburg and to have an opportunity of talking to BF Commander Vice Admiral Chirkov. At the meeting, we have discussed problems of cooperation and outlined directions for further partnership. Namely, it is organization of bilateral naval exercises and exchange of experience among ship commanding officers participated in the anti-piracy campaign in the Gulf of Aden. – This is a very important component of Russian Navy's service as well. Are there any joint actions between Russian and Danish warships in the Gulf of Aden? Have they ever met as allies fighting against the common enemy? – Undoubtedly, one of the core trends of our cooperation is joint anti-piracy activity off Africa. As of today, this is a very urgent question. Indeed, our ships have met in the Gulf of Aden. Russian and Danish warships have been sharing information and exchanging data in order to improve protection of merchant vessels from pirate attacks. We're satisfied with such interaction and hope that our partnership would strengthen. – When it is planned to conduct first Russian-Danish naval exercise? – It is our opinion that right now there is a good opportunity to start translating words into actions. Upon termination of the visit's official part, patrol frigate HMDS Thetis and corvette Stereguschiy will practice joint maneuvering and inter-ship communications. – Do our navies have any contacts other than anti-piracy mission off African coast? – Another great trend for cooperation is Arctic. Issues related to its exploration and ecological security problems which will inevitably appear are important for both countries. Russia and Denmark carry out certain activities in the Arctic region and should resolve all emerging problems together. – Thank you, sir, for the chance to ask you questions. Hopefully, coming exercise of frigate Thetis and corvette Stereguschiy would give an impulse to more large-scale cooperation between our navies throughout the globe. Finn Hansen was born in 1957. In 1977 he graduated from Royal Danish Naval Petty- and Reserve Officers School, and in 1981 – from Royal Danish Naval Academy. Finn Hansen started his naval career in 1981 in the rank of Lieutenant, in 1985 he was promoted to Lieutenant Commander, in 1991 – to Commander, in 1997 – to Commander Senior Grade, in 2004 – to Captain, in 2006 – to Rear Admiral. Throughout his service, Finn Hanson occupied positions of executive officer on patrol boat, deputy commander of Willemoes-class patrol boat unit, commanding officer of Soloven- and Willemoes-class patrol boats, corvette Niels Juel, inspection ship Hvidbjornen, held various posts ashore including Director of Danish Defense Acquisition and Logistics Agency, National Armaments Director, Director of Danish Defense Intelligence Service. 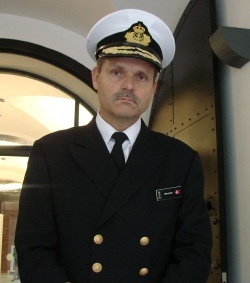 Finn Hansen has been in office of Admiral Danish Fleet since 2010.